Or loco, if you're The Mando Method Podcast co-hosts Armand Rosamilia and Chuck Buda, who toss out ways to get involved with the local writing community instead of always worrying about your reach across the world. National Novel Writing Month, where The Mando Method Podcast co-hosts Armand Rosamilia and Chuck Buda attempt 50,000 words on a book and usually have mixed results along the way. 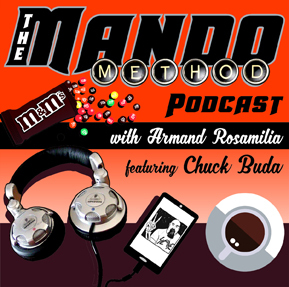 The Mando Method Podcast co-hosts Armand Rosamilia and Chuck Buda try to get a handle on schedules, releases and when it's more important to write than promote. The stuff your spouse puts in the bathroom because you stink... also, a bunch of random things The Mando Method Podcast co-hosts Armand Rosamilia and Chuck Buda talk about on this exciting episode.